Tennis: Could Stefanos Tsitsipas save tennis from the tyranny of the Big Three? Stefanos Tsitsipas beat Alex De Minaur 2-4, 4-1, 4-3 (3), 4-3 (3) to win the NextGen Finals in Milan. Federer, Nadal, and Djokovic: The tyranny of the Big Three. Could Stefanos Tsitsipas save tennis from the tyranny of the Big Three? 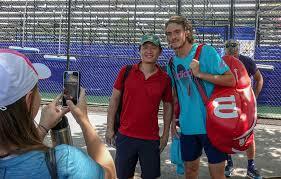 Tsitsipas has already been hailed as an exceptional talent by us. He plays an aggressive brand of all-court tennis with a powerful service and proactive attempts to finish points at the net. His single-handed backhand is quite powerful and the forehand truly excellent. Tsitsipas is an all-around talent with the potential to win multiple slams. His win over Alex De Minaur, a grinder, and retriever, is also a victory of talent and aggression over grinding and retrieving. At this moment Tsitsipas seems best equipped to save tennis from the tyranny of the BIG THREE. Stefanos Tsitsipas, we believe, is even better than Alexander Zverev who has yet to discover the way to the net. Alex De Minaur is a grinder par excellence. Alex De Minaur is a grinder par excellence. He is very quick on the court and tactically sound. De Mianur is as consistent as they come. He never beats himself in a match, and Stefanos Tsitsipas proved that he has what is required to beat De Minaur. De Minaur saved two match points in the fourth to extend the set into a tie-break. Tsitsipas, however, was in no mood for the fifth and closed out the fourth allowing Alex 3 points in the tie-break. When wielded by the exceptionally talented, the single-handed backhand is a deadly WMD. The single-hander is a tough shot to learn and even tougher to master. It’s unforgiving and a low margin shot which relies entirely on immaculate timing. The single-handed backhand, therefore, cannot be muscled. It requires exceptional talent to perfect the single-handed backhand, and Tsistsipas’ at 20 is already better than Federer’s at the same age. It will get even better over the next few years. The single-handed backhand, when wielded by the very talented, is a deadly WMD. Roger Federer employed the short angled slice to bring home eight Wimbledon crowns, and Pete Sampras for perfecting his net-approach and volleying skills to win seven Wimbledon titles. Stan Wawrinka uses his single-hander, as the hammer of Thor, to bully and punish even the accomplished grinders like Djokovic and Nadal. ← Tennis: Federer to take on Nishikori and Thiem will battle Anderson in the ATP Nitto Finals.